Imagine: A neighborhood by Lake Union with easy access to downtown, north Seattle, and 520. Do you suppose such a neighborhood has grown denser in recent decades? You bet it has! Eastlake is still mostly residential. 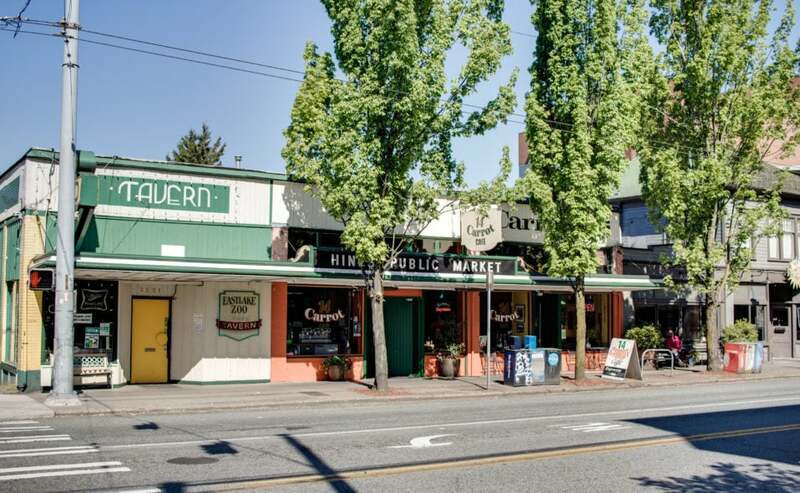 With fewer amenities and storefronts than the adjacent Capitol Hill neighborhood (or the University District across the canal). However, one finds pockets of commerce and bars along its main thoroughfare. Eastlake Ave, which connects the neighborhood to South Lake Union and the University District Bridge. It's residents like its quiet atmosphere. Especially those who live close to the lake shore, away from the highway. There, you'll also find the highest concentration of houseboats in Seattle. Meanwhile, beneath the highway is one of Seattle's most unique parks. The I-5 Colonnade, which offers winding mountain bike trails and skating areas in the heart of the city. Seattle Caviar Company: This long-running mecca of decadence offers upscale delights, many of which are sustainably sourced. Voxx Coffee: A small, sunny and comfy cafe centrally located in the Eastlake neighborhood. The I-5 Colonnade: A winding series of bike paths, trails, and an off-leash area running under the I-5 highway. Serafina: An acclaimed, multi-regional Italian restaurant with romantic indoor dining and a seasonal patio. Blind Pig Bistro: An intimate bar serving craft cocktails and bar bites with an eclectic, upscale spin.